A group of dedicated volunteers have transformed the look of Westhoughton railway station. 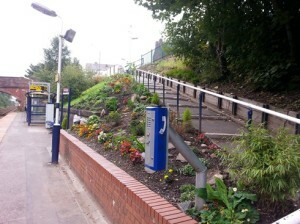 The Friends of Westhoughton Station team have planted a beautiful array of flowers along the banking that slopes down to the platform level. The group meet every other Sunday to carry out the work. They formed at the end of last year after feeling the station needed a bit of a makeover for commuters and visitors to the town to enjoy. Yvonne Woolley, a volunteer, told the local newspaper: “We have only been going since around January and a lot of people have commented on it. “One woman said she thought it was elves doing it as she would come on a Monday and would see the work that had been done. The station has also been cleared of rubbish that had built up and children visiting The Pottery Studio in Market Street have helped by creating animal ornaments for the banking. The next meeting of the Friends of Westhoughton station is set to take place on Wednesday (September 25) at 7pm at the Westhoughton Sports and Social Club at the Park Road and Market Street junction. Everyone is welcome to attend. Anyone interested in getting involved with the group should call Mrs Woolley on 01942 819980 or visit www.friends-of-westhoughton-station.org.uk.